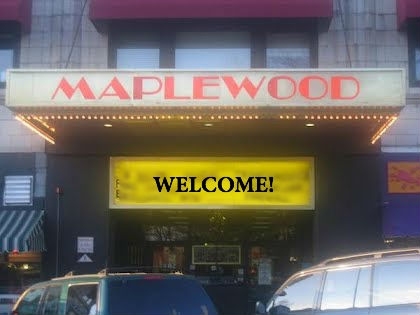 For over 20 years, under the CJM banner, the Maplewood Theater has been a participating member of the community. It has hosted Premieres for profit and non-profit organizations. It has celebrated birthdays, anniversaries, and has been a part of the memories being built in families. From taking their child to the movies for the first time to young daters coming here on their first date. People come to the movies for lots of reasons and not all having to do with what movies are showing. Sometimes it's just the warm smile or our hot buttered popcorn. We have hosted celebrities, schools, film festivals and held star studded premieres. We have opened our doors for groups that needed electricity, water or restroom facilities. Special Needs Schools have come and the children have enjoyed a movie when no other theater could accommodate that many wheelchairs. We have been thanked for our help and awarded for our movie and holiday displays. When the Maplewood Theater is called upon, it always answers.